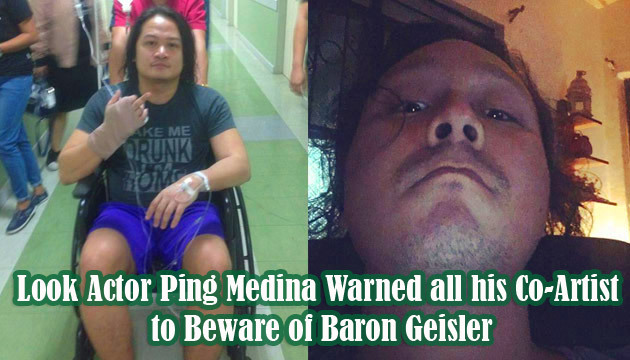 Actor Ping Medina took to his facebook account his enraged to his co-star Baron Geisler. He wrote a lengthy post about his encounter with the controversial actor during their scene for a film. According to Medina, he was relieved when he saw a calm Geisler when he arrived at their set. When they had a conversation, Baron told him that he was sober for 5 days for his mother was in ICU and she requested him not to smell alcohol. Medina thought that change is coming because it was the first time he talked to the actor with sense. He even gave Php 200 to Geisler to buy food but to his disappointment, he only used it to buy 4 bottles of Beer. When they were rehearsing, he feels irritated when Geisler was not in the right condition to do the scenes even if his lines were easy. When they are going to start their shooting, he recalled that the troubled actor told him that he will do something on their scene. He thought that Geisler might spit on him but something else happened that he did not expect. Medina’s role was bounded with a packaging tape on his mouth while Geisler was a kidnapper with his 3 goons. When Ping was acting to plead for his life, he saw Geisler suddenly open his zipper and urinated on him. Medina tried to compose himself so he just punched a cargo container that caused a fracture on his fist. When he saw Baron, he confronted and told him to have a fight but the latter refused his request. At the end of his post, he asked the people from the showbiz industry to stop giving Geisler any projects. When he was interviewed by ABSCBN News, he vowed to never work with Baron again but he has no plan to take a legal action. On Geisler’s defense, he reiterated that he had a permission from Medina and their director to improvise the scene. He also claimed that the incident was just a mere misunderstanding. However, Direk Arlyn Dela Cruz revealed that it’s not true and Geisler was ousted from the film.